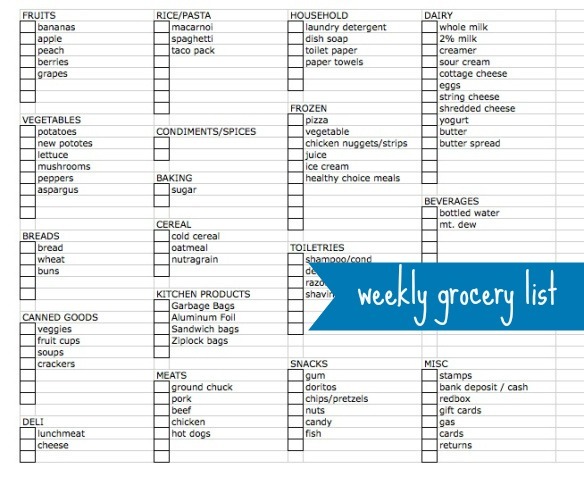 Weekly Grocery Shopping Made Easy! Look what I made… a Master Grocery List! So I guess that makes me a master grocer? Hardly! I am not a fan of grocery shopping, but…. it must be done. So why not make it as easy and efficient as possible. I have been wanting to make myself a list for awhile and finally got around to it tonight. I made it pretty simple – with only the things that I mostly by for our family. I also left a lot of blank spaces. I added a Misc. category at the end, you know… for those things that you add to your grocery run and don’t want to forget! This is just my first draft, I plan to add and update over the next few weeks as I shop. This is to use on a weekly basis, but I also have plans to make a monthly version, that way I can do a major stock-up on as much as I can in that trip, and pick up produce, dairy, meat and etc. each week. Want to make your own? Here are a few steps to become a Master Grocer yourself. 2. List these in order as they appear in your regular grocery store, so they are in order as you shop. 3. Start an excel or google spreadsheet of the list, use columns. 4. Leave blank spaces/lines for add ons (items you do not by as often). 5. Highlight the items you need for that shopping trip on the list before you shop. 6. Put a “C” by the items you have coupons for, add notes as needed. 7. “X” out the items you have put into your cart. 8. Update the list as needed. This entry was posted in project, systems and tagged grocery list, project on November 13, 2012 by projectmomma.